It's not too late to join the Qigong Healers sequence of classes right now. 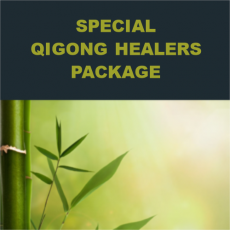 Get the Qigong and Chinese Medicine course for FREE when you register for the Beginning Qigong Healers Online and Intermediate Qigong Healers course. Only $450 ($160 discount)! It's not too late to enroll. All previous class meetings have been recorded and can be viewed once you register. Many people wonder if the Healers Webinars are a good use of their time and resources. If you want to take Qigong to a powerful level, then the answer is yes. These courses are designed to give you a personal experience of directing energy deep inside the body. Go deeply into sensing energy flow inside the body and learn techniques for healing tissue damage in the organs, muscles, joints, and bones. These webinars are for anyone interested in reaching a high level of understanding of energy flow. By practicing the techniques taught here, you will gain a profound control of the movement of energy and ability to direct the energy for healing very difficult to heal areas of the body. Third course is the Intermediate Qigong Healers Webinar, 8 lessons, 75 min. each. ; This course will begin live starting Wed. Jan. 24 at 12:20 pm EST. This course is usually $250 when taken alone. Get the two prerequisites and take the Intermediate Healers course for only $450 ($160 discount). The Intermediate Healers course is a continuation of the Beginning Healers course and will cover special techniques for healing - Buddha palm, energy scrubbing, neck and ear techniques, vessel orbits, joint work, nei gong, and 36 additional Acupuncture Points. Hands-on work follows the same format with regard to partners as mentioned for the Beginning Qigong Healers Webinar. Important Note: All of the techniques taught can be done on oneself or a partner. For this online healers course, you will practice using the techniques on yourself during the class time. If you are interested in practicing on another person, you must arrange for a partner to be present with you during the time the online class is offered so that you can practice on them. This option is entirely up to you and is not necessary to learn the techniques. You will be able to use the techniques you have learned in class to work on others on your own time. Just to be clear, there will only be time for one person to practice the techniques. If you have a partner to practice on, they will not be practicing the techniques on you. Each person must register for the course in order to practice the techniques. This course is live and interactive online : Wednesdays 12:30 pm - 1:45 pm, starting Jan. 24, 2018. For those who have taken this course with me before either as a seminar or weekly local class in Rochester, remember there is a 10% discount for repeating it. Note: you don’t have to meet with the class live to participate, you can participate through the recordings on your own schedule.